This is a free event along the seafront and in the air above Weston Bay. Once a single-day event, it was extended to 2 days in 2014. Weston-super-Mare marks Armed Forces Weekend at the same time as the airshow. Armed Forces Display Teams, Cadet Forces, military and civilian bands come together to celebrate the armed forces and the contribution they make. North Somerset Council organises the Weston Air Festival in partnership with Weston-super-Mare Town Council and the Weston Business Improvement District. The headline display was again the RAF Red Arrows. The other RAF teams supporting the centenary celebrations and the event were the Battle of Britain Memorial Flight with the Lancaster, Dakota, Spitfire and Hurricane and the noisy Eurofighter Typhoon. There were spectacular aerobatics from Twirlybatics in a Pitts Special; more light aerobatics from Team Raven, even lighter rotary action from the Autogyro and aerobatics with girls on the wings from AeroSuperBatics Wingwalkers. Vintage jet action came from the Strikemaster and a very rare display from the Red Bull's Bolkow BO-105 helicopter was a major attraction for aircraft enthusiasts. The flying list is summarised in the table. Several helicopters: a Royal Navy Merlin, Westland Whirlwind, Bristol 171 Sycamore, AS-550 Fennec from the Danish Air Force and a Westland Gazelle were on static display. There was an opening parade, led by the Band of Her Majesty’s Royal Marines, on the Beach Lawns, next to the seafront, to support the Armed Forces Day events. As well as flying and Armed Forces Day events, visitors enjoyed giant inflatables, a fun fair, trade stands, simulators, mini tanks, military exhibitions and displays, many charity and service support organisations. You can see the aircraft from many points along the coast but the main flying line is to the left of the pier as you face the sea. The planes will be at their lowest in front of Marine Parade, between the Premier Inn and where Uphill Road North becomes Beach Road. For an alternative view try Brean Down, a National Trust peninsular south of the town (use postcode TA8 2RS in the sat nav., then walk), from where you can enjoy a higher viewpoint, watching at the aircraft with Weston-super-Mare as a backdrop. Weston-super-Mare marks Armed Forces Weekend at the same time as the airshow. Armed Forces Display Teams, Cadet Forces, military and civilian bands came together to celebrate the armed forces and the contribution they make. This year's show was headlined by the Red Arrows, Eurofighter Typhoon and Battle of Britain Memorial Flight. Last year's favourites, the Strikemaster and Rich Goodwin's incomparable display in his much-altered Pitts S-2S 'Muscle Biplane' were both back. It was possible to enjoy, too, some very close flying and sparkling aerobatics from the Trig Team in their two Pitts Specials; from Team Raven in their four Vans RVs and solo aerobatics from Mark Jefferies in an Extra 330. Aerobatics from different size teams - solo, pairs and fours; and in different aircraft, all in brilliant sunshine. As well as flying and Armed Forces Day events there was arena entertainment, giant inflatables, a fun fair, trade stands, simulators, mini tanks, military exhibitions and displays, many charity and service support organisations. Mustang 'Tall in the Saddle' and MiG-15. Solos on Saturday. Swordfish. Unserviceable for the whole of 2017 season. There is invariably a fair amount of military involvement in airshows, so combining the local show with armed forces weekend is a smart move. The events support each other and share the side-shows, such as trade or charity stalls and family entertainment. The Air Festival at Weston-super-Mare has grown over the years. Since 2014 it has been held over the two-day weekend. 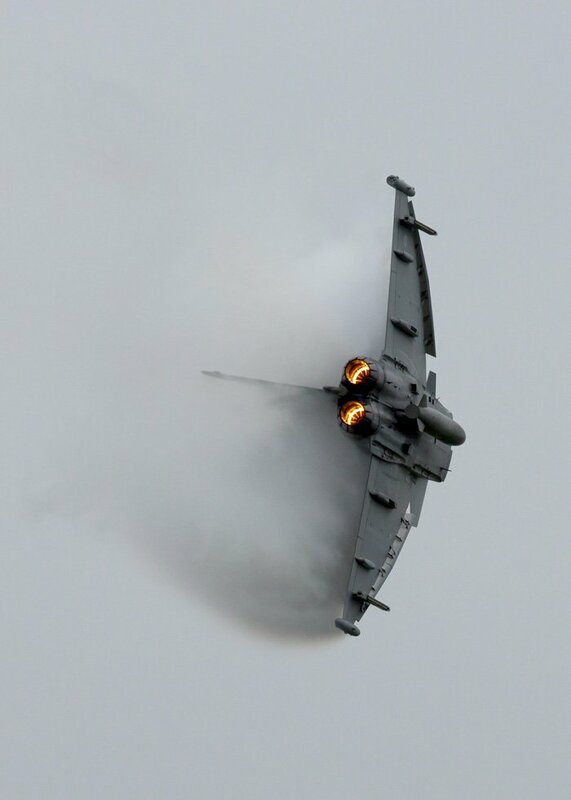 The development of the show has brought with it an expansion in the number of displays, including the Red Arrows for this and the previous three years and, for the first time in 2016, the Eurofighter Typhoon. 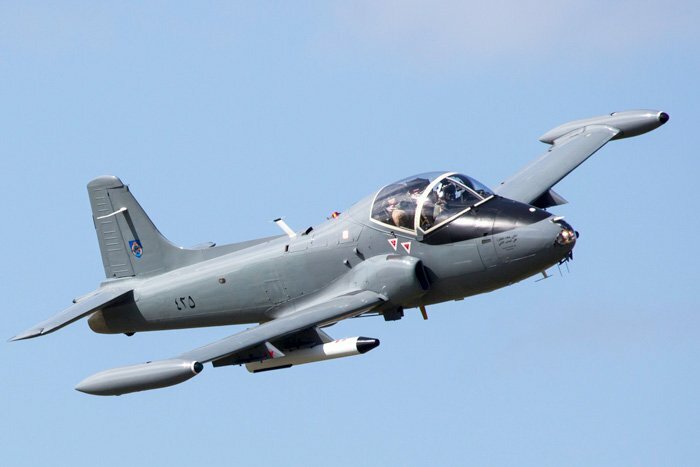 Despite the regulatory issues since the 2015 Shoreham incident, there were also civilian jet displays from the Gnat Display Team and the NWMAS (Mark Petrie's) Strikemaster. Unfortunately there were some cancellations, too. The chilly, sometimes breezy conditions on Saturday turned to damper, ultimately wet weather on Sunday, causing many of the scheduled flying displays to be delayed and some ultimately cancelled. In particular it was disappointing not to see the much-anticipated Sea Vixen; another vintage jet, the MiG-15 and the very popular B-17 'Sally B'. It is also worth visiting the static aircraft park at airshows such as Weston-super-Mare. Perhaps the most interesting was the only remaining airworthy Westland Whirlwind in the bright yellow of Search and Rescue helicopters of the age and a welcome visit from Westland Gazelle G-CBGZ, both on the lawn for the Saturday only. Seaside shows do depend to a great degree on the 3 S's: sea, sun and superb flying. Weston-super-Mare has not been particularly lucky with the 'sun' part recently. In 2015 the sea mist almost closed in on the Red Arrows and in 2016 they were limited to a rolling display, whilst other displays battled with very challenging conditions not only at the show but between the show and their home base. It is to the credit of the pilots and the organisers that, despite mother nature's efforts, so many displays did go ahead. In 2017 it is Weston-super-Mare's turn for blue skies. Use sat Nav BS23 1BE until you get close, but ignore the sat nav in favour of local directions signs as soon as you see them. There are links to route planners in the Travel Advice column if you prefer to plan ahead or don't have sat nav. National Express have coach services to Weston-super-Mare from Bristol (Service 040) and Leeds, Sheffield and the South-West (Services 324 and 320). Buses to Weston-super-Mare from surrounding areas are run by First Group. Near the date they may run special Airshow services. Local services within Weston-super-Mare and nearby villages are offered by Crossville Motor Services. Weston-Super-Mare station is about 10 minutes walk from the seaside. There are Premier Inn hotels on the seafront, in town and a third within 4 miles.